Fabian Ruiz saw no reason for alarm when he received an Elseid Hysaj pass in the middle of his own half with 25 minutes on the clock at the Emirates Stadium, but over his shoulder, Lucas Torreira was closing in. In a flash, the little Uruguayan had nicked the ball off the Napoli midfielder's toes. Seconds after that, his low shot was bouncing off Kalidou Koulibaly and into the net. It was Arsenal's second goal of the night following Aaron Ramsey's opener and could prove crucial when they head to Italy for next week's second leg. But for Torreira, it was just one of many standout moments in a performance which underlined his importance to Unai Emery's side. This was his first start since serving a three-match suspension for his sending off against Tottenham last month, and it was a timely return to action. Arsenal beat Manchester United and Newcastle here without him, but they felt his absence keenly in Sunday's 1-0 loss to Everton. Emery's side had problems all over the pitch at Goodison Park, in truth, but the issues were most pronounced in central midfield, where Matteo Guendouzi, Mohamed Elneny and Ramsey were outfought and outplayed by Andre Gomes and Idrissa Gueye. What a relief, then, to be able to call on Torreira again against Napoli. He had a big job on his hands in front of the defence, with Dries Mertens, Lorenzo Insigne, Piotr Zielinski and Jose Callejon buzzing around him at all angles, but he made it look easy. Arsenal's midfield, so listless against Everton, had balance and bite again. Torreira's impact was immediate, his energy and intensity helping to snuff out danger and push Arsenal forward right from the start. In the space of a few seconds in the 10th minute, he snapped into a tackle on Mario Rui to launch a break, then, when the attack broke down, he was there at the heels of Allan to win the ball back again. 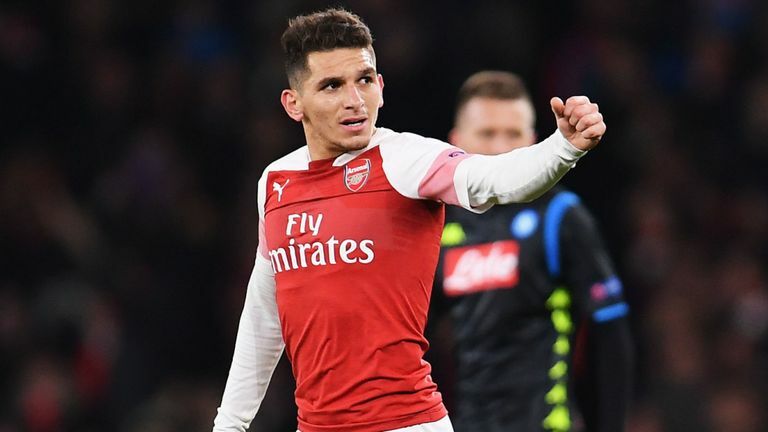 Napoli manager Carlo Ancelotti would later speak about how his side were "overwhelmed" by Arsenal's pressing in the first half and it owed a lot to Torreira. He set the tone, even charging down Napoli players straight from their kick-off following Ramsey's goal. Arsenal's second came just moments after he had pounced on another loose touch by Ruiz. Torreira was combative presence, throwing himself into tackles and barely giving Napoli time to breathe on the ball, but his awareness and positioning were just as important. At one point soon after half-time, when Zielinski was shaping to shoot from a Napoli cut-back, Torreira simply stole in front of him and dribbled the ball away from danger. His performance was also notable for how it impacted Ramsey. Emery described Ramsey's contribution as "awesome" in his post-match press conference, lauding his commitment to the cause despite his impending move to Juventus, but the Welshman was helped by having the perfect partner in Torreira. The 23-year-old's discipline and diligence gave Ramsey a platform from which to bomb forward. Indeed, Ramsey's goal, superbly taken from Ainsley Maitland-Niles' pass after a slick passing move which also involved Mesut Ozil and Alexandre Lacazette, was one of five shots from him over the course of the 90 minutes. With Torreira there to sweep up behind him, he was able to charge forward to deadly effect. Torreira used the ball well too. Arsenal's counter-attacks invariably passed through him and at times he created scoring chances himself. At one point in the first half, he showed the presence of mind to pick out Pierre-Emerick Aubameyang in a more dangerous position when the crowd were imploring him to shoot. Torreira succumbed to cramp in the closing stages, understandably tired following his recent spell on the sidelines, but his standing ovation upon being replaced by Elneny showed his efforts had not gone unnoticed. At the final whistle, he was back on the pitch to celebrate the victory with his team-mates and share more adulation from the crowd.